When it comes to coding web pages always remember to “separate content from presentation”. This essentially means to use bare bones html with semantic meaning and enhance the HTML tags with the presentation which would be the Cascading Style Sheets or CSS. Speaking of CSS, the styling of your webpage should have meaning as well. 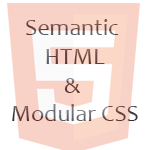 I prefer to use the SMACSS approach when writing CSS which stands for Scalable and Modular Architecture for CSS. With the SMACCS approach you organize a CSS file into categories. You want to keep your CSS as clean and specific as possible. If you have complicated CSS which uses selectors that go deep from the start of the DOM tree to your content, then if you change the HTML structure you will have to redo the CSS. By minimizing the depth of the CSS you can easily make changes to the HTML while keeping the CSS structure intact. Prev Give your website a face-lift and checkup in 2017! Next so long 2016, welcome 2017!